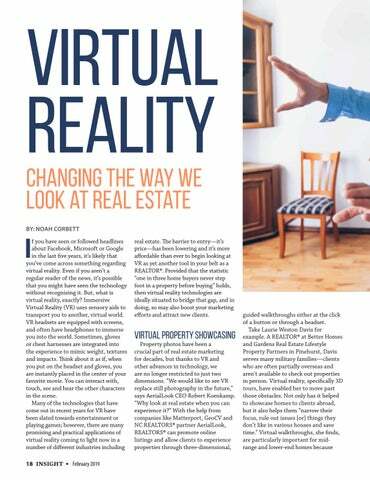 Learn how to embrace virtual reality technology in your real estate business today and in the future. Read stories of hope, service and support from members and volunteers impacted by the storm. 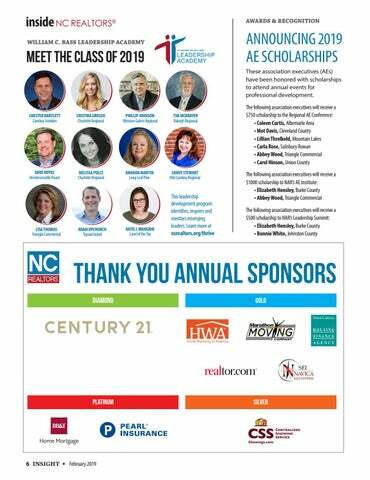 11	5	INSIDE NC REALTORS® Updates on the Heck-Andrews House, the NC REALTORS® William C. Bass Leadership 12	Academy class of 2019 and AE scholarship recipients. As I begin to serve as your 2019 president, I am so grateful for the opportunity to work with REALTORS® who continue to fight for and support our clients, community and industry. I have learned from the excellent examples of past leadership that volunteerism is what makes our association effective. Getting engaged in leadership at the local, state and national levels has really helped me understand how much of an excellent job the leaders and staff that came before me have done to make us a strong association. That’s why my slogan this year is “NC REALTORS® has your B.A.C.K.” B.A.C.K. stands for: Building on the past leadership of this organization; Advocating in the present for our clients, community and industry; Creating our future together, will be the Key to our success. I was taught at an early age that we must contribute before we complain. It is interesting to see that when a person is engaged and involved, the tendency to complain about something they feel strongly about is diminished. Instead, they are working with other like-minded individuals to influence change. My initiatives this year include working with our Young Professionals Network (YPN) to increase our REALTOR® Political Action Committee (RPAC) participation efforts. We need as many REALTORS® as possible investing in their business to affect public policies at all levels. To accomplish this goal, I plan to form a YPN presidential advisory group to gain insight on how to keep our association relevant and to prepare for where our industry is going in the future. I also plan to engage more diverse REALTOR® leaders around the state in order to be more inclusive and to involve as many different perspectives as possible. It is our differences that make us the great country that we are, and our association can only benefit from these efforts. When advocating for our clients, community and industry, we need to be as equitable in our approach as possible to ensure we are reaching and influencing as many of the legislators as we can. Equitable lobbying and RPAC funding distribution are other initiatives I will be concentrating on to make sure we are moving in that direction. Lastly, I hope to increase our exposure at the National Association of REALTORS® (NAR) to ensure we are consistently engaged at the national level. I also plan to work with our president-elect, Maren Brisson-Kuester, on creating synergy with rural and urban areas around the state to foster economic development and more business opportunities. I look forward to working with all of you to have a great year. I feel so grateful to have the opportunity to serve. I realize that we are all entrepreneurs who work hard to ensure that homeownership and private property rights are protected in this country. Real estate is not as easy as it used to be. Today’s clients are very sophisticated and have high expectations. Real estate data is all over the internet, and there are many different models of the real estate business entering the market. 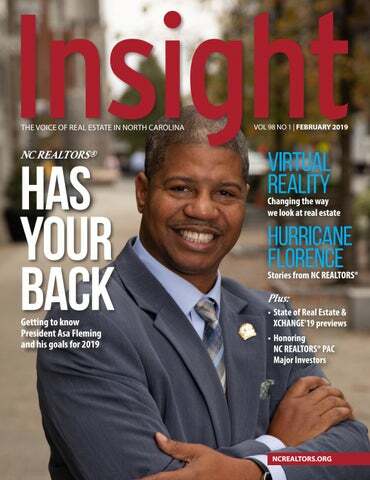 Through it all, just remember, NC REALTORS® has your back! fter more than two years of waiting, the renovation of the historic HeckAndrews House has commenced. Supported by the team of architect James Grady, Progressive Contracting and an army of specialize subcontractors, work began in late 2018 to restore the property to its historic character and to provide functional space for events and the work of the NC REALTORS® Government Affairs office. FOLLOW THE PROGRESS As the project moves forward, we invite you to follow @HeckAndrewsHouse on Instagram for updates on the restoration process and a unique glimpse into the details and craftsmanship of the property's past. Discover more about the history of the house and NC REALTORS® involvement at heck-andrewshouse.com. ANNOUNCING 2019 AE SCHOLARSHIPS These association executives (AEs) have been honored with scholarships to attend annual events for professional development. HOW DID YOU DO? Turn the page to discover the answer. If you’re not doing so already, be sure to read the Q&As that appear in the REALTOR® Rundown every Monday. It’ll help you on the next quiz! 5. (a) True. See paragraph 2 of the Contingent Sale Addendum. (b) True. See paragraph 2 of the Contingent Sale Addendum. (c) False. Seller's termination right is "cut off" by the buyer's delivery of another contract for the buyer's property. See paragraph 2 of the Contingent Sale Addendum. (d) False. The seller is obligated to return any due diligence fee only if the seller terminates the contract during the due diligence period. See paragraph 2 of the Contingent Sale Addendum, last sentence. OWN YOUR PRESENT. EMPOWER YOUR FUTURE. You can lead the way. Commitment to Excellence empowers you to enhance and showcase your high level of professionalism. It gives you an advantage in an increasingly competitive market and shows consumers youâ&#x20AC;&#x2122;re committed to conducting business at the highest standard. Be committed to excellence. Get started today at C2EX.realtor. Carol Bradley Fred Gainey Kristina Farrell As of 2/25/19. Homeownership. Private property owners’ rights. Productive regulation. That’s our charge. 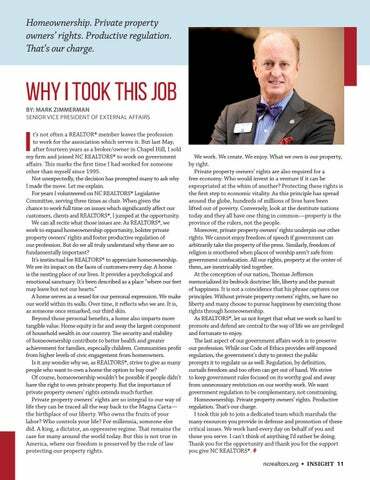 t’s not often a REALTOR® member leaves the profession to work for the association which serves it. But last May, after fourteen years as a broker/owner in Chapel Hill, I sold my firm and joined NC REALTORS® to work on government affairs. This marks the first time I had worked for someone other than myself since 1995. Not unexpectedly, the decision has prompted many to ask why I made the move. Let me explain. For years I volunteered on NC REALTORS® Legislative Committee, serving three times as chair. When given the chance to work full time on issues which significantly affect our customers, clients and REALTORS®, I jumped at the opportunity. We can all recite what those issues are. As REALTORS®, we work to expand homeownership opportunity, bolster private property owners’ rights and foster productive regulation of our profession. But do we all truly understand why these are so fundamentally important? It’s instinctual for REALTORS® to appreciate homeownership. We see its impact on the faces of customers every day. A home is the nesting place of our lives. It provides a psychological and emotional sanctuary. It’s been described as a place “where our feet may leave but not our hearts.” A home serves as a vessel for our personal expression. We make our world within its walls. Over time, it reflects who we are. It is, as someone once remarked, our third skin. Beyond those personal benefits, a home also imparts more tangible value. Home equity is far and away the largest component of household wealth in our country. The security and stability of homeownership contribute to better health and greater achievement for families, especially children. Communities profit from higher levels of civic engagement from homeowners. Is it any wonder why we, as REALTORS®, strive to give as many people who want to own a home the option to buy one? Of course, homeownership wouldn’t be possible if people didn’t have the right to own private property. But the importance of private property owners’ rights extends much further. Private property owners’ rights are so integral to our way of life they can be traced all the way back to the Magna Carta— the birthplace of our liberty. Who owns the fruits of your labor? Who controls your life? For millennia, someone else did. A king, a dictator, an oppressive regime. That remains the case for many around the world today. But this is not true in America, where our freedom is preserved by the rule of law protecting our property rights. NC REALTORS®, Platinum R Raleigh Regional Association of REALTORS®, Platinum R Land of the Sky Association of REALTORS®, Crystal R Investments made through the NAR PAF or CAP programs. #InvestforImpact in 2019 ncrealtors.org/invest Contributions to RPAC are not deductible for federal or state income tax purposes. Contributions are voluntary and are used for political purposes. Suggested amounts are merely guidelines and you may contribute more or less than the suggested amounts. The National Association of REALTORS® and its state and local associations will not favor or disadvantage any member because of the amount contributed or a decision not to contribute. You may refuse to contribute without reprisal. Your contribution is split between National RPAC and the State PAC in your state. NC RPAC supports the efforts of National RPAC and contributes a portion of its contributions to National RPAC. Contact your State Association or PAC for information about the percentages of your contribution provided to National RPAC and to the State PAC. The National RPAC portion is used to support federal candidates and is charged against your limits under 52 U.S.C. 30116. In-kind contributions/donations are not included for the purposes of the National RPAC State PAC split. NC law requires political committees to report the name, mailing address, job title or profession and name of employer or employee's specific field for each individual whose contributions aggregate is in excess of $50 in an election cycle. Contributions can only be accepted from individuals in the form of personal checks or credit cards. Contributions from corporations or business entities cannot be accepted. This solicitation was paid for by NC RPAC. Our association slogan, “Be Epic. Be an NC REALTOR®,” emphasizes the super-human qualities that make NC REALTORS® so epic. Like superheros! What would your REALTOR® superpower be? Our association slogan is a true depiction of what being a REALTOR® is all about. REALTORS® advocate for their clients, community, industry and each other. They care about educating the consumer, and protecting the right to own private property. Going above and beyond is a characteristic of a REALTOR®. The commitment and dedication is tremendous and is an example for other industries to follow. And, my superhero power would be the “Advocator”. Any other key notes about your life or career? I am always seeking to give back and increase my awareness. 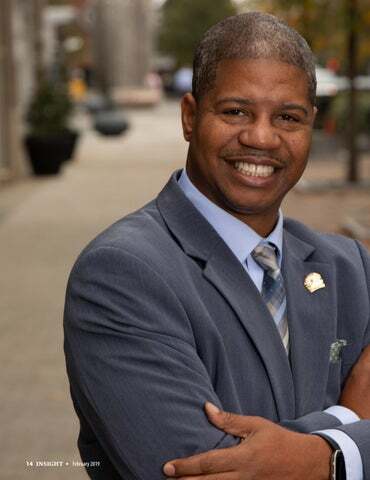 I'm vice chair for Southeast Raleigh Promise, an organization that believes in the promise of the people of Southeast Raleigh and works with other partnerships to enhance the quality of life in Southeast Raleigh. I'm a founding board member and treasurer of Central Wake High School, a charter school that focuses on dropout prevention and gives students a second chance. I serve on the board of The Carying Place, which is a nonprofit that help homeless people learn how to manage their finances and secure housing. I also serve on the Wake County Planning Board. 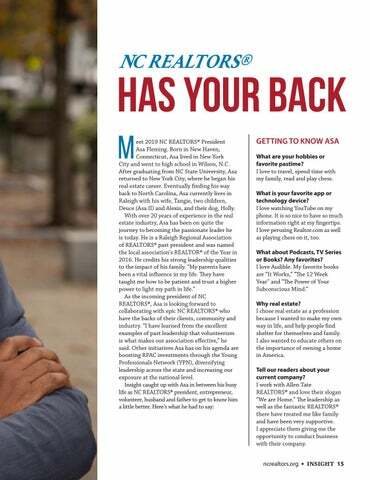 This year, Asa is traveling the state to highlight epic NC REALTORS® who have your back. In our first episode, he visited the Triad to learn how Housing Consultants Group founder Sofia Crisp supports the Greensboro and High Point communities. Crisp is a REALTOR® of 25 years who is passionate about providing education for first-time home buyers and assisting those through disaster relief. Catch the interview on YouTube or listen via the NC REALTORS® REdefined podcast on Apple Podcasts or Google Play. A focused discussion on the opportunities and challenges facing the state’s housing industry. Join thought leaders from across North Carolina and nationally recognized experts for a conversation on the opportunities and challenges facing our state now and into the future. 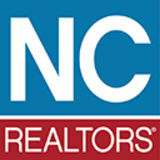 The inaugural NC REALTORS® State of Real Estate is a can’t miss event. Bringing together public and private sectors, REALTORS® and consumers, influencers and regulators, and visionaries and implementers, this year’s forum is designed to examine the state’s housing industry. real estate. The barrier to entry—it’s price—has been lowering and it’s more affordable than ever to begin looking at VR as yet another tool in your belt as a REALTOR®. Provided that the statistic “one in three home buyers never step foot in a property before buying” holds, then virtual reality technologies are ideally situated to bridge that gap, and in doing, so may also boost your marketing efforts and attract new clients. Think About This According to REA Group, buyers were 60 percent more likely to email an agent, and 95 percent more likely to call an agent after viewing a property with a 3D walkthrough. 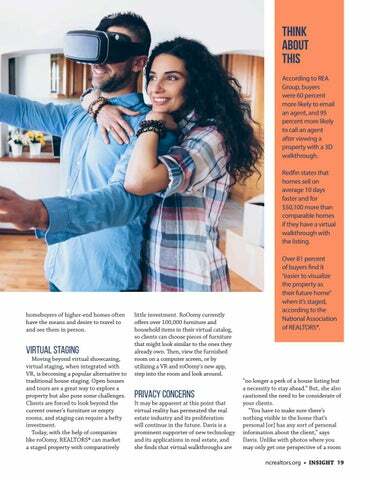 Redfin states that homes sell on average 10 days faster and for $50,100 more than comparable homes if they have a virtual walkthrough with the listing. homebuyers of higher-end homes often have the means and desire to travel to and see them in person. little investment. RoOomy currently offers over 100,000 furniture and household items in their virtual catalog, so clients can choose pieces of furniture that might look similar to the ones they already own. Then, view the furnished room on a computer screen, or by utilizing a VR and roOomy's new app, step into the room and look around. Over 81 percent of buyers find it “easier to visualize the property as their future home” when it’s staged, according to the National Association of REALTORS®. According to Goldman Sachs, by 2025 the industry around VR will be worth $80 billion and it’s projected that VR applications in real estate will be worth $2.6 billion alone. same time. As of today, the price for a Matterport camera hasn’t changed for years. Plus, you’re locked into image hosting which costs between $500 and $1,500 per year. To skirt this particular cost, a number of brokerages hire professionals, like AerialLook, to shoot virtual tours for them which can sometimes afford them extra perks or a more complete package (drone footage, still photos, etc.). But again, that may not be particularly affordable, either. GeoCV is still beta testing right now, but they provide a different approach to 3D walkthroughs and virtual tours. Instead of using expensive cameras and hosting services, GeoCV relies on your phone, provided it can shoot 3D photos. This model costs much less upfront and gives the REALTOR® the ability to shoot the virtual walkthrough themselves. “[VR has] never been more affordable. Users can access VR from their mobile phones and inexpensive headsets,” says Koenekamp. And, as VR has developed, “we have been able to reduce the overall cost of implementing VR by increasing the [number of] VR tours we produce.” In other words, even if you can’t reasonably afford virtual reality technology today, in the future, the price will continue to drop and become more affordable to everyone. Learn more about AerialLook and the REALTOR® Partners Program at ncrealtors.org/save. walking through a house itself, and not just jumping from one camera location to the next, which is what the technology is limited to today. The prospect of future advancement, and the founding of competitors to companies like Matterport, just goes to show that this business sector is still emerging. Therefore, when the price goes down and new competitors enter the market, VR in real estate has a strong and healthy future. 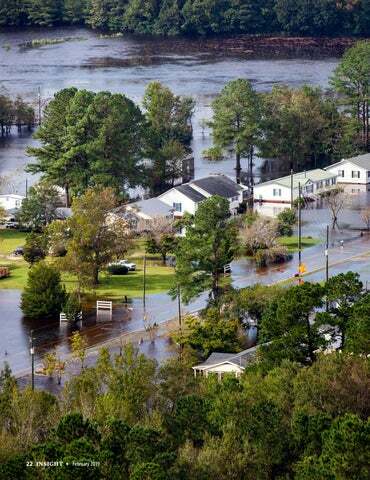 For the second time in one year, the NC REALTORS® Housing Foundation was called into action to undertake a significant assistance effort after a natural disaster. More than double the amount set aside for previous mortgage and rental assistance efforts, the foundation’s Hurricane Florence effort has aided 830 North Carolinian families with more than $800,000 in direct relief aid. Since the disaster, we reached out to a number of our members and volunteers who were affected by the storm. These are their stories. From The News & Observer. © 2018 McClatchy. All rights reserved. Used under license. In April of 2018, the Housing Foundation anticipated that the tornado would not be the foundation’s last natural disaster assistance program, but to have that prediction proven so quickly was something we weren’t expecting. However, it has reinstalled our appreciation for the volunteers that have spent countless hours helping people around them, and redoubled our dedication to the Housing Foundation’s vision: REALTORS® are the voice of community strength. When REALTORS® come together, housing victims can regain their hope and their home. NC REALTORS® should take pride in their public example of endurance and compassion in the face of nature’s wrath. 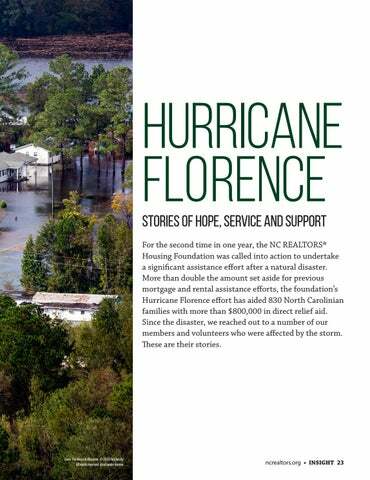 To learn more about disaster relief and the Housing Foundation, visit ncrealtorshf.org. Network with colleagues and vendors at these special events. VIDEO MARKETING RUNNING A SUCCESSFUL BUSINESS SOCIAL MEDIA DATA & RISK MANAGEMENT LEAD GENERATION AND MORE! Visit xchange19.com for schedule, session descriptions and speakers. *Separate registration & fees required. Moving You One Mile at A Time! Marathon is recognized by HomeAdvisor as a Top Rated, Elite Moving Company in North Carolina. Why trust your move to anyone but the best? 336-895-1605 www.marathonmovingco.com Local, Intrastate, National Moves, and Storage. Free Quotes. White glove service. Mark Zimmerman explains why he made the move from broker/owner to NC REALTORS® staff member. Legal Quiz | Do you know how to handle a Contingent Sale Agreement? 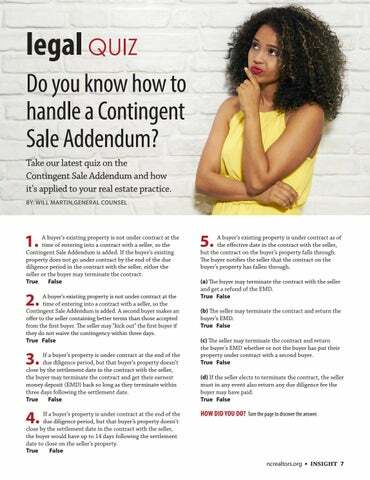 Take our latest quiz on the Contingent Sale Addendum and how it's applied to your real estate practice.